I've featured your fair styles a few times here on My Fair Vanity and I'm always bowled over by your fair, kind, rockin' ensembles, so I've decided to make it a regular feature. 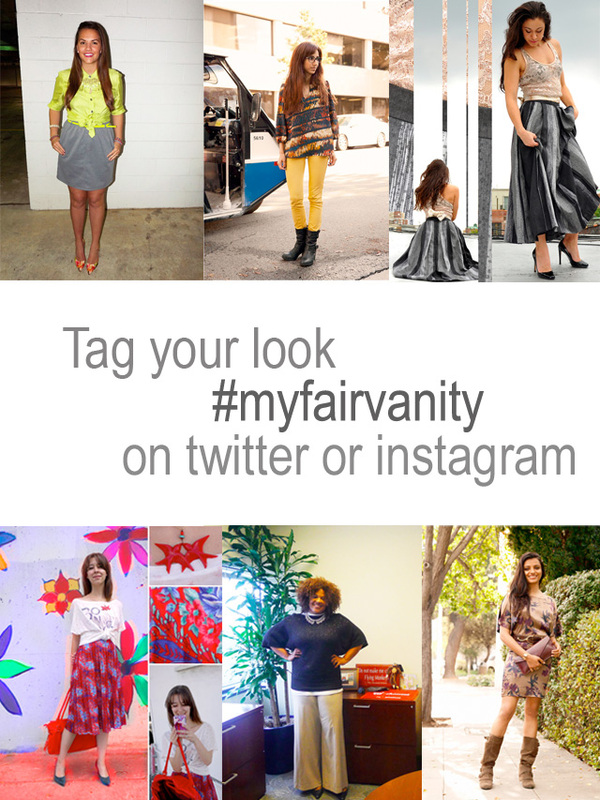 Snap a picture, tag it #myfairvanity on Twitter or Instagram, and mention which item of your ensemble is fair. At the beginning of each month, I'll share your pix in a post and show some link love to your social media account or blog. And (obvi) I will be retweeting and reposting your awesomeness. Above, for example, you are seeing the fair stylings of Waverly of Pich and Roor, the Amour Vert girls, Mode Marteau, Aaryn West, and Emily of Capital Style! Waverly is wearing a thrifted top and skirt; the Amour Vert girls' dresses are made in the USA; Aaryn is rockin some vintage pieces; Mode Marteau's skirt is second-hand; and Emily is wearing a thrifted sweater and trousers. Here's my theory: I'd bet each one of you wears something fair and kind almost every day without even realizing it. Sharing a picture of your fair item and/or how your wore it will highlight for your friends and followers how easy it is to be fair, kind and fab. So tag those photos #myfairvanity and give yourself a pat on the back for your eco act of kindness. Then look for yourself here on My Fair Vanity at the beginning of each month! Yay, I can't wait to see! wow this is the gorgeous collection.